Ah, this one would have fitted in perfectly with my ‘love triangles and sisters’ theme. I suspect the conclusion, no matter what it is, is rather grim – there just can’t be a happy ending with one. Lovely review. This novella by an author I hadn’t heard of does sound wonderful. The examples of the writing you provide, really beautiful. Thanks, Ali. I doubt whether I’d have discovered this author without the Daunt Books edition as the cover caught my eye when I was browsing last year. I really like Bourdouxhe’s prose style, too – nothing too showy, just very clear and effective. Great quotes (and review) Jacqui. The author and book are perviously unknown to me but now I will put it on that list of books to drown under. Thanks, Seamus. I think you might like this one, and it’s very short! Even n your brief summery the pain and repressed emotion of Elisa seems striking. That last passage that you quoted was fantastic. Thanks, Poppy. How timely! This is a book for you, definitely – I think you’d love it. Yes, Elisa needs to know what’s going on between Gilles and Victorine, but she cannot bring herself to confront it head on. There are so many points during the story where she could say something to Gilles, but instead she decides to remain silent. As you say, it would be fascinating to compare with Simone de Beauvoir, whom I’ve never read (not yet, anyway). Are you planning to review She Came to Stay? I hope so. I’m definitely intrigued (and frustrated) by Elisa’s silence – and that she ends up counselling Gilles… aaarrrggghh But know it’s often the case! Yes hoping to review most, if not all, of my #WITMonth reads… but how & when still elusive! Mind, husband is taking kids away for long weekend – 4 days home alone!!! Bliss! I know, the counselling scenes will test your patience as you’ll almost certainly want to grab hold of Elisa and give her a good shake. Yes, they’ve published some very interesting books recently. I also like the look of Sylvia by Leonard Michaels, which came out a month or two ago (another stunning cover). As for the Bourdouxhe, it’s quite an affecting little story. I loved the clean, direct prose style. Nice review – I hadn’t heard of this one before but will keep an eye out for it. Thanks. It’s well worth it. Great review Jacqui – I had been circling this one, thinking it sounded a little like de Beauvoir (and also Sagan’s “A Certain Smile” which I just read and which is told from a different point of view!) I do wonder about the present tense, though – I’m not always comfortable with that kind of prose. Thanks, Karen. I wondered if this one might be on your radar. It’s excellent, and I think you would like the themes and prose style (tenses aside). Bourdouxhe’s use of tense is very interesting, and the translator’s afterword includes a few notes on it. The novel is mostly written in the past tense, but the author uses the historic present for several extended passages, particularly the most intense moments. I think it works here because it gives these scenes a sense of immediacy as though you’re right there in the moment with Elisa. The prose flows very well, so much so that after a while I almost didn’t notice the switches between tenses. Thanks Jacqui – that’s all useful to know. Yes, a review of the Sagan will follow eventually – I am a little behind….! Great. Oh, I’ve got a similar backlog – my reviews are running a good month behind my reading at the moment! I think all three characters would drive me a bit crazy with their actions, but from your quotes, it sounds like the upheaval is dealt with rather quietly. Very intriguing, especially with the unhappy ending you hinted at! I love the cover of your edition, and I’m happy to see that used copies are available in the U.S. Yes, I can understand that! There are times when you just want to intervene to try and set things on a different course. I really felt for Elisa, though, as she doesn’t appear to have anything in her life other than Gilles and her sister. She can’t speak to her mother, and there’s no close friend for her to confide in. For the most part, it’s a very quiet, introspective novel, but I’m not going to say anything else about the ending! Great cover, isn’t it? The image really attracted me to the story. What a fantastic review! And I have been reading a lot of novellas lately. This one is definitely going on my TBR pile! Thanks, Melissa! Oh, I love novellas – there’s something very satisfying about being able to read a complete book in a couple of hours. I would definitely recommend this one. This sounds very interesting indeed; what an excellent review, too. Many thanks. Thanks, John. I was just about to say there’s the basis for a great little film (or play) here, but it’s already been done. I’ve no idea whether it’s any good or not. I’m so curious now about how it ends – I will have to see if there is any way to get my hands on a copy of this book around here. II like the subtle way you managed that without giving too much away. That is ver hard to do, as I am discovering with a book I’m wrestling with at the moment! Thanks. It can be quite difficult to know where to draw the line, but I’m glad you think I’ve got it about right here. I’m going to face a similar challenge with a collection of short stories I’m reading right now, especially as some of them are only one or two pages long! I hope you manage to find a way forward with your review! I just finished Ford Madox Ford’s The Good Soldier – this sounds almost as though it could be an appendage to it! I’ve never before heard of the author. Kudos to the publisher for keeping the French title, and how nice to discover that Daunt is more than just a book retailer (I took a look at the publishing arm site – beautiful editions indeed!). I liked The Good Soldier very much – it made my end-of-year highlights last year. Are you planning to review it? I hope so. The Bourdouxhe isn’t in quite the same league as the Ford Madox Ford (which to be fair sets a very high benchmark!) but you’re right, it address similar territory. The title is interesting, and there’s a note about it in the translator’s excellent afterword. It was a conscious decision on the part of Bourdouxhe to use the word “femme” as opposed to “épouse”. She wanted to convey the dual meaning as Elisa has to be both woman and wife of Gilles. But once Gilles and Victorine begin their affair, Elisa is no longer his woman and his wife in name only. I think Bourdouxhe wanted to tap into those different interpretations of the word “femme”, hence the decision to retain the French title. Yes, it’s a beautiful edition: a smart cover design, French flaps, that type of thing. The Daunt Books list is very tempting – I quite like the look of Sylvia by Leonard Michaels. And I love their bookshops – the one in Marylebone is dangerously close to the place one of my clients uses for business meetings! I’ve read a few of her novels but sadly cannot remember much. I know though that it made an impression at the time. I think I liked “Marie” better. Not sure it’s available in English. I loved the mood of this. I didn’t even notice they had kept the French title. My brain just switches automatically and I don’t notice. I guess you don’t have this distinction in English. Femme and épouse is interchnageable but femme has other meanings, while wife is only épouse and Gilles’ woman would have meant something entirely different. When you call someone “femme” it’s still pretty clear that they are married. Not so if you use “homme” – that’s another thing entirely. You’d have to choose between mari and époux. Yes, I loved the mood as well. There’s a terrible sense of foreboding from quite an early stage, and yet it never feels overly dramatic. I’m glad they kept the French title. As you say, “femme” has more than one meaning, and there isn’t a neat way of translating that subtlety into English, not in a single word anyway. Indeed. I’m not sure I could keep everything inside like that. She’s incredibly patient with Gilles while he seems utterly oblivious to her pain. Hello Jacqui: Don’t know what is going on w/wordpress this week but I haven’t received many posts. I read this after seeing the film (which is recommended btw). I have a thing about the book-film connection. Used to be very picky and insisted on reading the book first, but I’m no longer so inflexible. I didn’t read through all the comments to see if anyone asked you about the film, but if you get a chance to see it, grab that dvd. I read this several years ago, and you’re right, it does linger in the mind. I wish more of her work was translated. No worries, Guy. WordPress notifications can be a bit flaky every now and again! I think I may have missed out on some posts this week as well. I’m glad you’ve mentioned the film as I noticed it had been adapted for the screen but wasn’t sure whether it was any good or not. (It struck me as the type of story that could work on the stage although I don’t know if it’s ever been turned into a play.) Anyway, sounds as though the DVD is well worth a look – thanks for that. 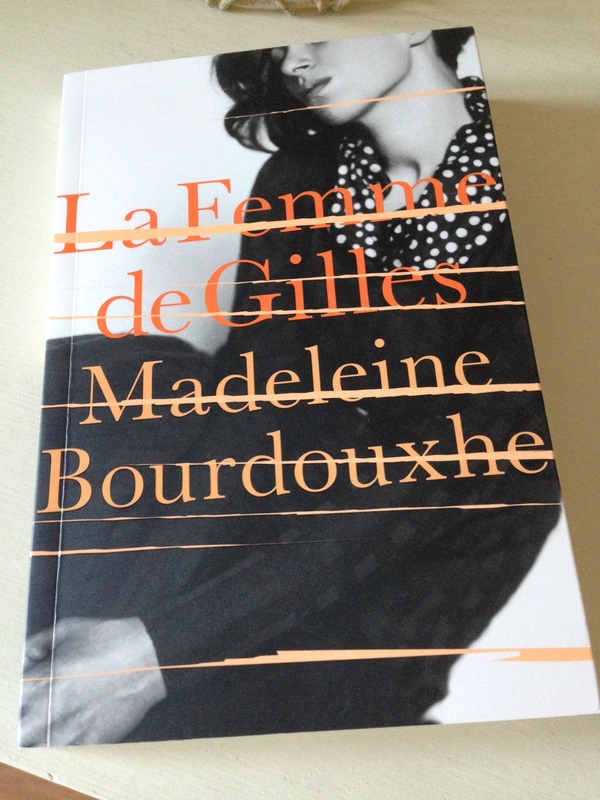 Did you review La Femme de Gilles? I’ll head over to yours to take a look. As for this author’s other work, Daunt Books got in touch with me via twitter to say they’ve got another Bourdouxhe coming next summer. No details yet, but I’m wondering if it might be the one that Caroline liked: ‘Marie’. This sounds remarkably interesting – though I fear you are yet another blogger with designs on sending my TBR even more out of control than it currently is. having had a quick look at some of what you are urging upon us with interesting reviews I’m feeling very nervous indeed. ……. I liked this novella very much. She holds you quite close to Elisa’s point of view, and there’s something quite powerful about that. Ha – yes, that’s one of the upsides/downsides of following a range of different book bloggers. There’s always something to tempt you! That sounds simply fantastic, if horribly painful. Interesting they didn’t translate the title – Gilles’ woman – I note Caroline’s rather interesting comments but it captures a sense of possession and identity wrapped up in another. It’s a brutal title in its own way. Anyway, straight on the list. Hooray! Yes, go for this over the Costello, Max. In a different year it would have made my highlights list, but I read so many great books last year that I struggled to find a place for this one. Oddly enough, I was reminded of it when I read Simenon’s The Widow earlier this year as there are similarities in a couple of areas. Yes, interesting background on the title – I quite like the fact they kept the French version. The French Title “La Femme de Gilles” is used for the English Translation which is very unhelpful for anyone who wants to find the wonderful French Original.